Draft: 2001, Pittsburgh Pirates, 33rd rd. March 19, 2011 1B Chris Shelton assigned to New York Mets. February 20, 2011 1B Chris Shelton assigned to Buffalo Bisons. February 19, 2011 New York Mets signed free agent IF Chris Shelton to a minor league contract. November 6, 2010 Chris Shelton elected free agency. July 28, 2010 1B Chris Shelton assigned to Round Rock Express. July 24, 2010 Round Rock Express sent 1B Chris Shelton on a rehab assignment to GCL Astros. June 14, 2010 Round Rock Express placed 1B Chris Shelton on the 7-day disabled list. April 4, 2010 1B Chris Shelton assigned to Round Rock Express from Houston Astros. December 8, 2009 Houston Astros signed free agent Chris Shelton. October 6, 2009 3B Chris Shelton elected free agency. August 5, 2009 Seattle Mariners sent 3B Chris Shelton outright to Tacoma Rainiers. August 1, 2009 Seattle Mariners designated 3B Chris Shelton for assignment. July 9, 2009 Seattle Mariners selected the contract of 3B Chris Shelton from Tacoma Rainiers. September 2, 2006 Chris Shelton roster status changed by Detroit Tigers. May 31, 2005 Chris Shelton roster status changed by Detroit Tigers. July 10, 2004 Chris Shelton roster status changed by Detroit Tigers. 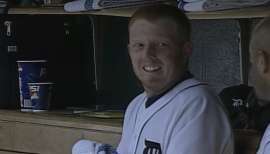 May 31, 2004 Detroit Tigers placed 1B Chris Shelton on the 15-day disabled list. December 15, 2003 Detroit Tigers claimed 1B Chris Shelton off waivers from .